Established in 1872 — before our young nation had even celebrated its centennial — Yellowstone is America’s first national park. Blessed with an uncanny natural grandeur that has inspired and captivated explorers, conservationists, scientists, artists and travelers for generations, the park’s 2.2 million mostly undeveloped acres are home to free-roaming herds of elk and bison, towering waterfalls and more than half of the world’s geysers. All this in an area larger than Delaware and Rhode Island combined, which spreads over three state lines. Open all year round, visitors to Yellowstone will find a bevy of activities to choose from. Winter visitors can explore the interior on a snowmobile, in a snowcoach (a motorized tour bus mounted on giant skis or treads) or via cross-country skiing — or just watch the bison roam at Mammoth Hot Springs. Warm-weather travelers can explore the park’s numerous bike trails, fish for trout in its lakes and steams, or backpack in Yellowstone’s sublime wilderness. Whatever your pleasure is, at Yellowstone nature and history are never far away. Echoing its rustic past, the park’s numerous lodges, visitor centers and historic districts compliment Yellowstone’s natural surroundings. 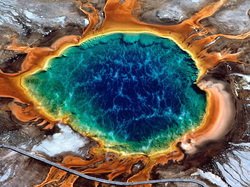 Click to see a detailed Yellowstone National Park Map.